On their first official appearance together she wore a ‘husband’ shirt. Now Meghan Markle has moved into Prince Harry’s Toronto hotel suite while he is in the city for his Invictus Games. The couple are staying in one of the best rooms at the Fairmont Royal York, one of Canada’s leading hotels. 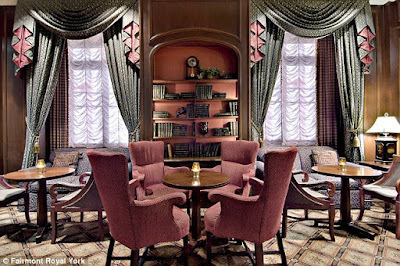 It is not known which suite they are occupying but the Royal Suite – which would certainly be appropriate – has a bar, fireplace and 16-seater dining room. It costs 2,318 Canadian dollars a night including taxes, or almost £1,400. 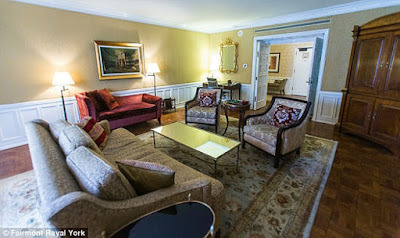 One of the smaller suites would be 1,854 Canadian dollars (£1,160). Although she was born in the US, Miss Markle has lived in Toronto, where she films the legal drama Suits, for five years. When he visits his girlfriend in the city, Harry, 33, normally stays at her rented house in a quiet, upmarket suburb. Cars being used by his security detail were spotted at the low-key residence when he arrived in Canada last week, several days before the start of the Invictus Games, the sporting competition Harry created for injured servicemen. 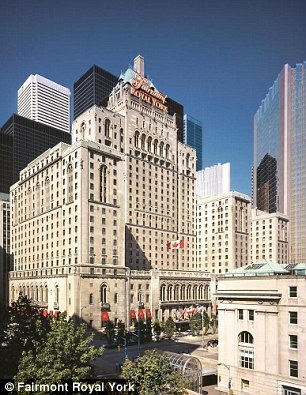 Since then, the couple have moved to downtown Toronto, where they have been discreetly living together at the Fairmont.